Kells, 20.01.2016 - MDI Medical gives its annual seasonal donation to two very important local charities: Childline Ireland and Marie Curie hospice in Belfast. The funds will help support the lives of vulnerable children, and help to provide a better life for people living with any terminal illness, and their families. "In the spirit of Christmas, we wanted to continue our tradition to support selected local charity organisations, instead of sending seasonal greeting cards. As usual, our personnel in Belfast and Kells voted what charity is to receive our donation, and this year most of the votes went to Childline Ireland and Marie Curie Hospice," says Colin Paul, Managing Director, MDI Medical. 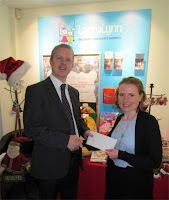 Throughout the year MDI Medical also made donations to Laura Lynn Children’s Hospice, Order of Malta for a new Ambulance in Kells and on a regular basis to Trocaire and Concern Worldwide. For 25 years, MDI Medical has served as the quality partner to Irish healthcare in the supply, installation and service of sophisticated medical devices and systems. MDI Medical works closely with Hospitals, Primary Care Centres and Industry to meet their needs in Diagnosis, Monitoring, Resuscitation and Preventative Medicine. Copyright © 2017 MDI Medical All Right Reserved.